Ideum’s experimental projection mapping exhibit receives a 2019 German Design Award and is shortlisted for the One Show 2019. 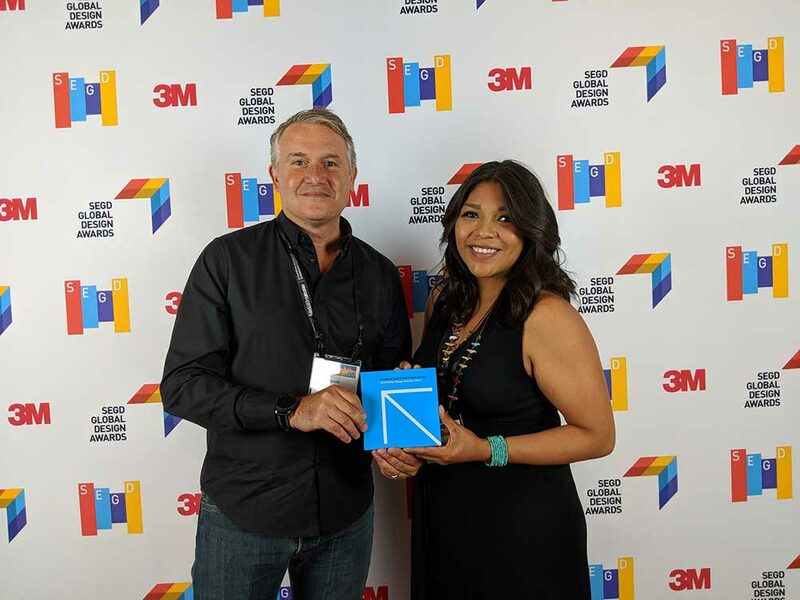 Updated: 3/29/19 - the Exploring Pueblo Pottery project has also received a Gold 2019 APEX Award in the Experiential Design & Planning category. Updated: 2/27/19 - the Exploring Pueblo Pottery project has since been nominated as a 2019 APEX Awards Finalist. 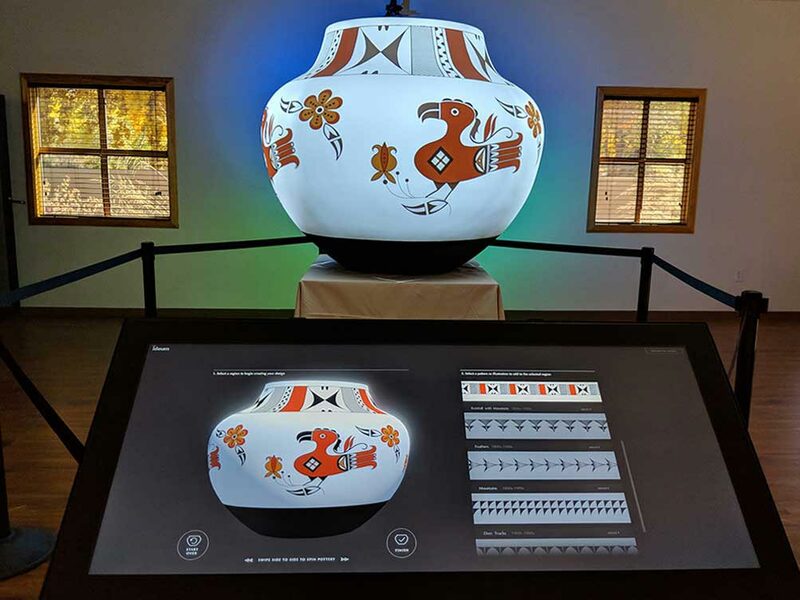 The Ideum team was thrilled to learn that Exploring Pueblo Pottery, an interactive projection mapping exhibit we developed in collaboration with Acoma Pueblo artist Michelle Lowden, is the winner of a 2019 German Design Award. Award recipients are honored for “pioneering contributions to the German and international design landscape.” The awards jury is comprised of esteemed designers and artists charged with selecting projects that advance the design-oriented community. The jury noted that Exploring Pueblo Pottery is “a tremendously stimulating combination of innovative technology and history, seemingly encouraging playful learning.” The jury also attributed special mention for both Excellent Product Design and Computers and Communication. This marks the second major design award for the project. 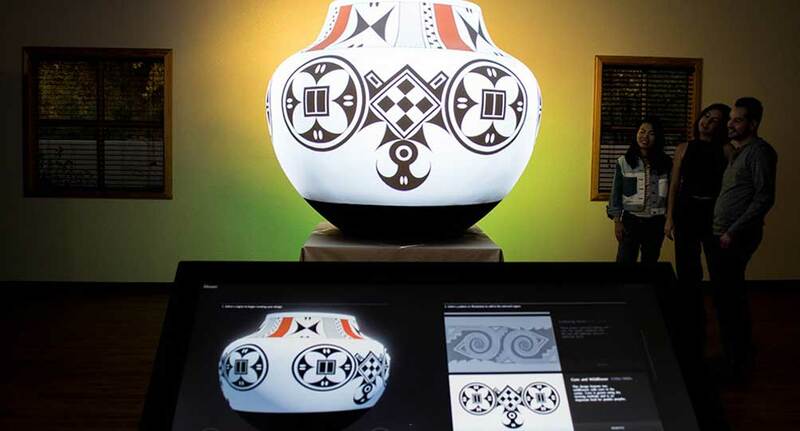 In 2018, Exploring Pueblo Pottery received a Global Design Award from SEGD, the Society for Experiential Graphic Design. The project has also been shortlisted for a design award from the One Show 2019. 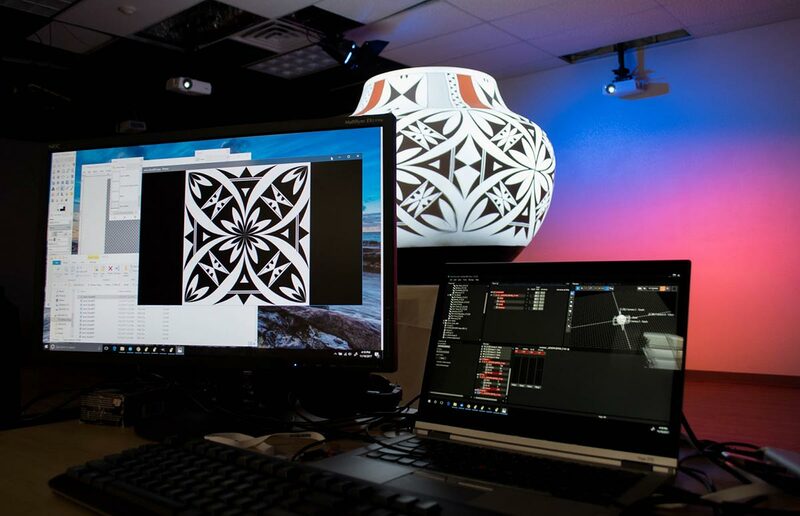 The installation allows users to investigate beautiful and intricate Acoma designs and learn about Pueblo art, history, and culture. 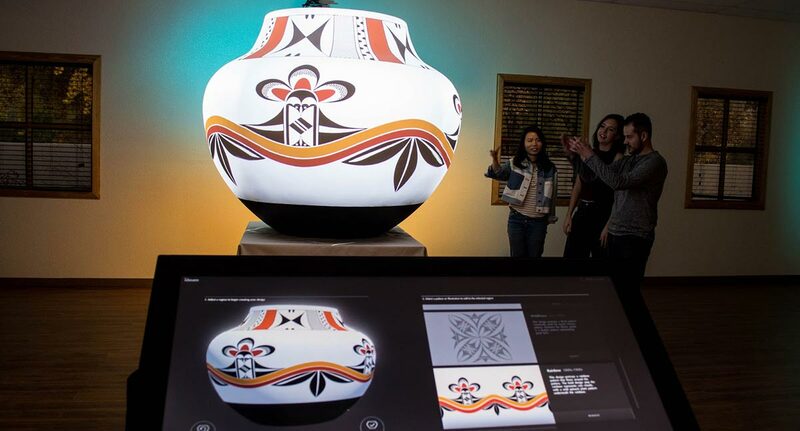 Visitors browse and select from a range of designs using an Ideum multitouch screen; once selected, the images are animated and cast onto an oversized olla, or water pot, by 4 overhead projectors. Viewers see the blank pot come alive with detailed images of clouds, rain, mountains, animals, and wildflowers. The motifs at the heart of the exhibit were created by Lowden, and UNM professor and potter Clarence Cruz provided thoughtful guidance and oversight. 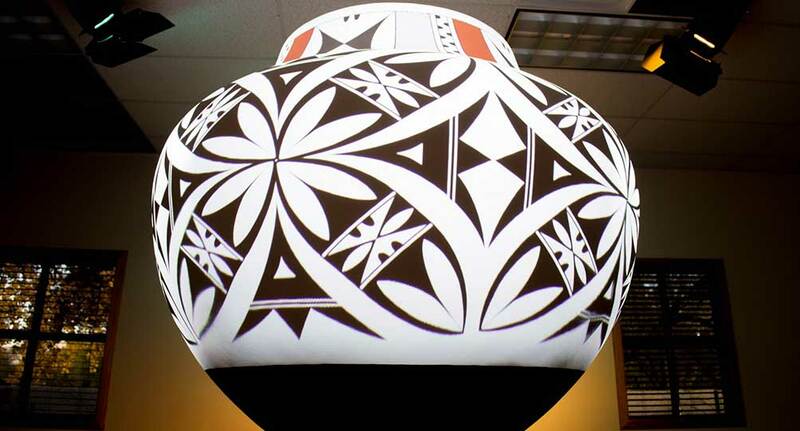 “It was great to collaborate with Michelle on the Pueblo Pottery project and to bring her traditional designs into a new medium and present them in an entirely new way,” said Spadaccini. In addition, more than a dozen Ideum team members, including designers, software developers, and hardware technicians, collaborated to join complex hardware and custom software to create this deeply immersive experience. The German Design Awards ceremony will take place at the Ambiente Fair in Frankfurt, Germany, on February 8, 2019. The exhibit uses cutting-edge technology and innovative experience design to shine new light onto ancient motifs. The project also received a Global Design Award from SEGD in 2018.